This holiday is based in the “Kingdom” of County Kerry, in the vibrant scenic town of Killarney and the traditional friendly market town of Caherciveen. It offers you what may seem to be the impossible - two bases (no packing and unpacking each day) but with a sense of completing a journey. Four legs of the Kerry Way, old coach and butter roads, take you from the Atlantic Ocean, on the shore of Dingle Bay, through the wild valleys of Mid Kerry to the Killarney National Park. The experience of travelling on foot as in days of yore is complemented by superb views, unique flora and fauna and a landscape imbued with folklore. Add ample opportunities to enjoy the craic (the fun) of evenings in an Irish pub and you get a satisfying cultural experience. 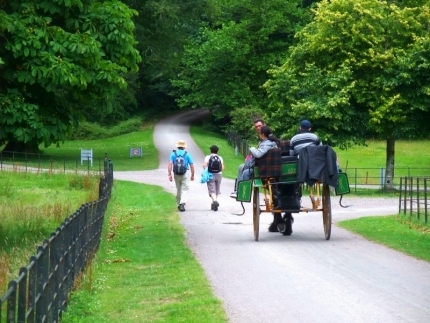 It offers you an easy and gentle walking programme combined with the best of ancient and modern Ireland - and some very unique and memorable experiences. Imagine combining the stunning lake, mountain and Atlantic scenery of the South West of Ireland with Irish Music, ancient castles and manor houses, Irish farming traditions, learning to play the Bodhran, a magical evening walk to a prehistoric Ring Fort, an island cruise and a Traditional Irish session! All this, and more, is combined with traditional Irish hospitality, good food and friendly people to make this an unforgettable week, ideal for people seeking a real Irish experience. This is a gentle walking programme combined with wonderful Celtic cultural activities.